Combine 3 Tbsp. Country Crock® with Sunflower Oil, herbs and garlic in small bowl. Set aside. Season chicken with sea salt and pepper. Melt remaining 1 Tbsp. 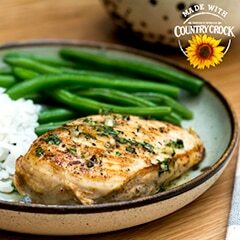 Country Crock® with Sunflower Oil in large skillet over medium-high heat and cook chicken, turning once, until thoroughly cooked, about 8 minutes. Transfer chicken to serving platter. Drizzle with pan juices and top with herb spread.